Every new freemason is welcome to the Institution in a lodge, which is the core place where the masonic works take place. Every lodge, which shall count a minimum of 7 affiliates of the initiatory community, assembles at the seat of the local Orient, which is usually geographically located in correspondence with a regional administrative centre or a city of the area. 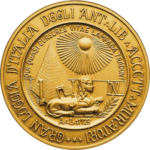 The national headquarters of the Gran Loggia d’Italia of the A:.L:.A:.M:. coordinates all the lodges of the Obedience, by verifying their compliance to the statutes and the regularity of the works. The seat is located in Rome in Via San Nicola de’ Cesarini 3 (tel. 0039-06-6893249). The offices of the national seat are open everyday, from 9:00 to 16:00 and it is possible to book a guided tour of the National Temple and Museum for groups and schools.